Looking for an amazing snack for your little ones when they are home from school? Why not try these yummy pizza pinwheels? 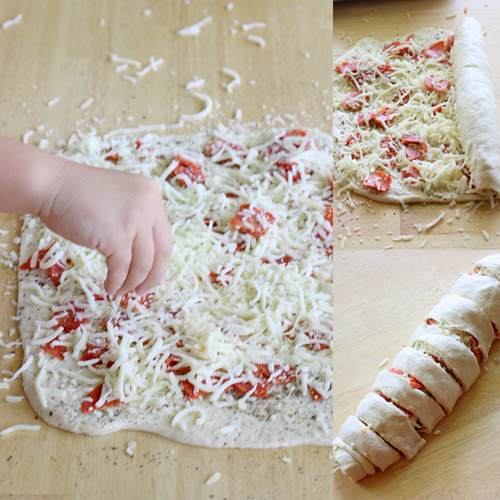 It is a fun and delicious way to do pizza as a snack. Of course it will be a huge hit with boys who love pizza and see it as its very own food group, it’s a vegetable right? Pair them with some marinara sauce for dipping and you will have some very happy (and full!) boys. What You Need: Pillsbury refrigerated pizza crust Garlic Salt Basil Olive Oil Mozzarella Cheese Pepperoni Marinara Sauce (You can purchase this or make your own) Directions: 1. Roll out the pizza dough on a flat surface. 2. Use a brush or spoon to put a thin layer of olive oil on the dough. 3. Sprinkle Garlic Salt and Basil as desired on top of olive oil. 4. Sprinkle with cheese and top with pepperoni. 5. Roll dough to form a log, and then slice into 1-inch pieces. 6. Place rolls on a lightly greased baking sheet. Bake for 10 minutes or until brown on top. 7. 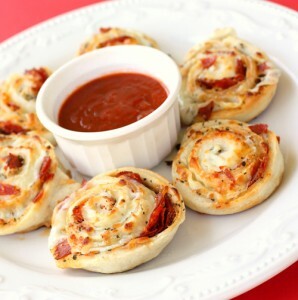 Warm marinara sauce and serve with pizza pinwheels as dipping sauce. Now you and your kids have a great new treat for those hungry afternoons, or pair it with a salad and serve it up for dinner one night. It also makes a great appetizer at parties! Enjoy! This entry was posted in Activities, General and tagged appetizers, boy friendly recipes, food, fun snacks, party snacks, the boys store on January 23, 2012 by Lacy.